The city of Johnston is located within Polk County. It has a population of 17,278 residents and is part of the Des Moines-West Des Moines Metropolitan Area. At last count, there were 4,720 families residing in 6,618 housing units. Homes in the area are mostly single-family units. The median home value here is $226,700. There has been a substantial increase (4.0 percent) over the last year. Real estate analysts are predicting another 1.8 percent increase in the coming year. Although there is a slight fluctuation in the market from month-to-month, valuations remain fairly stable. 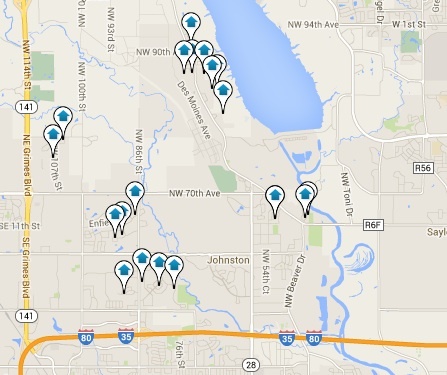 Another sign of a healthy market in Johnston is the median price per square foot rate. The median list price is currently $141 while the Des Moines Metro area currently has a price of $118 per square foot. The gap between list price and sold price is another sign of a healthy future for the area. The median price of homes listed locally is $234,900 while the median price sold is $217,575. Johnston has seen an almost 100 percent increase in population growth between the 2,010 census and the 2,000 census. This amazing increase in residency has increased the need for construction locally. A significant factor to take into consideration is that the city is bordered by the Des Moines River to the East and Interstate 80 to the South.